Jammu and Kashmir (J&K) Police claimed on Sunday to have unearthed a nexus between stone-throwers and Lashkar-e-Taiba (LeT) in south Kashmir. They said they busted two modules of LeT and arrested nine people who were instigating youths to pelt stones. “Our investigation shows that LeT divisional commander for south Kashmir Abdul Rehman alias Rehman Bhai was directly involved in fomenting stone-pelting,” Shafaqat Watali, deputy inspector general (DIG) of police(south Kashmir range), said. The lid was blown off when police arrested Showkat Ahmad Dar. Iran’s Interior Minister Mostafa Mohammad-Najjar said the “terrorists” who carried out the bomb attacks yesterday received training in Pakistan. “A group of terrorists who are unfortunately being trained on the other side of our eastern borders, in Pakistan, committed this terrorist act,” he said, cited by the state-run Islamic Republic News Agency. At least 38 people were killed in two bombings outside a mosque in Iran’s southeastern city of Chabahar during the annual Shiite Muslim ceremonies of Ashura, the agency said yesterday. Two Hizbul Mujahideen militants were today arrested by Himachal Pradesh Police from a hideout at Kotla village in Jawali tehsil of Kangra district. The two have been identified as Jameed Ahmad (35) and Ghulam Nabi (25), both residents of Doda district of Jammu and Kashmir that borders Chamba district of Himachal Pradesh. Police said they were hiding in Jawali since November. The police interrogating underworld criminal Madoor Yusuf alias Isubu, 32, suspect that he planned to assassinate former deputy prime minister and senior BJP leader LK Advani. Yusuf and his associates allegedly tried to breach the Z-category security accorded to the senior politician by influencing a National Security Guards jawan, who was part of the protective ring around Advani. Curfew was imposed in several parts of this Jammu and Kashmir summer capital here Wednesday to prevent a Muharram procession. “Curfew has been imposed in police station areas of Kralkhud, Shaheedgunj, Maisuma, Kothibagh and Ram Munshibagh in Srinagar to maintain peace in the city,” a senior police officer said here. The curfew has been imposed to prevent a Muharram procession scheduled to be carried out from the Shaheedgunj area, half a kilometre from city centre Lal Chowk. A powerful blast shook Varanasi’s Shitla Ghat when ‘Ganga aarti’ was under way on Tuesday evening, killing a two-year-old girl and injuring over 21 people. Among the injured are some foreigners. Trinamul Congress supporters led by Subhendu Adhikari today foiled a CPM bid to “recapture” Khejuri and chased away Left leaders and armed cadres who were celebrating an initial success with a feast. Police, however, were “silent bystanders” during the day-long clashes. A 17-year-old boy was hit by a stray bullet in his left leg during a bomb-and-bullet duel between the two parties. This morning, around 500 armed CPM cadres arrived in East Midnapore’s Khejuri in two 10-wheeler trucks and other vehicles to recapture territory the party had lost to Trinamul after last year’s Lok Sabha elections. The CPM group, led by Khejuri zonal secretary Himangshu Das, barged into Kamardah village at 5am. The cadres hurled bombs and fired in the air to create panic, residents said. They also put up barricades with bamboo sticks and hoisted party flags. The residents said around half of the CPM group comprised supporters and activists who had fled their homes in Khejuri and neighbouring Nandigram fearing Trinamul attacks. The rest were “outsiders”. The CPM supporters and activists forced the residents of Kamardah to march with them. Many CPM cadres then entered the local high school and asked the cook of the institution’s hostel to prepare food for the “warriors”. The CPM men provided the cook, Prajapati Mondal, with provisions for the “feast”. Several CPM supporters also entered the Kamardah local committee office, which had been lying closed since the 2009 Lok Sabha polls. As news of the CPM “recapture” attempt spread, Trinamul leader and Tamluk MP Adhikari reached Kamardah with around 1,000 party activists and supporters. The Trinamul activists ransacked the local CPM office and set it on fire before descending on the school where the CPM cadres were holding the feast. “The cadres had just sat down for lunch when the Trinamul activists attacked them,” Mondal said. The heavily outnumbered CPM activists started fleeing when they saw the Trinamul mob arrive, local residents said. Several of the cadres left behind their arms in their hurry to escape. Both sides exchanged fire and hurled bombs at each other as the cadres retreated. Dipak Pramanik, 17, a Class XI student, was hit by a stray bullet in his left shin while he was returning home to Birbandar village, adjoining Kamardah.He was taken to a Contai hospital. Doctors said he was out of danger. Late in the evening, sources said the cadres were stuck at Birbandar as Trinamul had blocked all approach roads to Khejuri. N. Chakraborty, the additional superintendent of police from Haldia, and his Contai counterpart H. Meena had reached Khejuri with a big force around 6am. But local residents alleged they did not intervene when the CPM activists entered Kamardah. The police did nothing even when the Trinamul and CPM activists clashed, the residents added. The Trinamul activists put up barricades on all arterial roads leading to East Midnapore, including the Digha-Calcutta highway. Several Khejuri residents had to walk 15km to reach home. CPM district secretary Kanu Sahu accused Trinamul of “foiling our efforts to bring displaced Left supporters back to their homes in Khejuri. Trinamul leader Partha Chatterjee said a party delegation would visit Khejuri and Nandigram tomorrow on Mamata Banerjee’s instructions . “Armed CPM cadres, backed by outsiders, unleashed terror in Khejuri in their bid to reclaim territory,” he alleged. The chief minister held a meeting at Writers’ Buildings with the chief secretary and top police officers this afternoon and discussed the situation in Khejuri, sources said. At least seven people have been killed and many more injured when Moroccan forces raided a protest camp near Western Sahara’s main city of Laayoune, which is under the military control of Morocco. 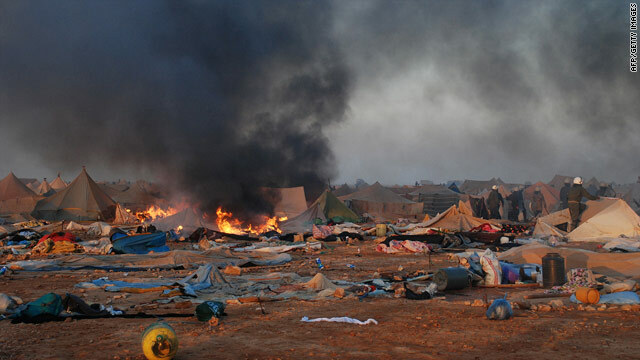 The Gdaim Izik camp, which houses 12,000 Saharawi refugees, had sprung up four weeks ago, according to one version, in protest against the deteriorating living conditions in the area and the ongoing political stalemate. But according to another version, protests are seeking independence from Morocco. The clashes are believed to have been some of the worst in the territory, which is a former Spanish colony, that has been under Morocco’s partial military control since 1975. Rabat says the territory should come under its sovereignty, while the Polisario Front, which fought a guerilla war with Morocco for years, insists on a UN referendum that would enable the Saharawi people to choose between autonomy, independence or integration with Morocco. The violence came shortly before another round of talks between Polisario representatives and Moroccan senior officials began in the US.